A nice Christmas embroidery set of 8 organza lace machine embroidery designs. 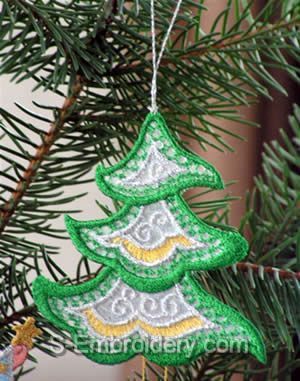 The designs are available in different versions that will let you use them to create fine ornaments for the Christmas tree, decorations for your hand-made Christmas greeting cards or use them to decorate Christmas socks, doilies, table runners or any other Christmas embroidery projects. The images further down the page will give you an idea of the possible application of this set. Note: These designs are NOT free standing lace.They have to be stitched on organza or suitable fabric. This design is available in 3 versions - #1 is to be stitched out on organza and to be used as decoration for Christmas greeting cards; #2 is also stitched out on organza but it has a hoop got hanging on the Christmas tree; #3 and #4 (mirrored copy of #3) are to be stitched out on fabric. 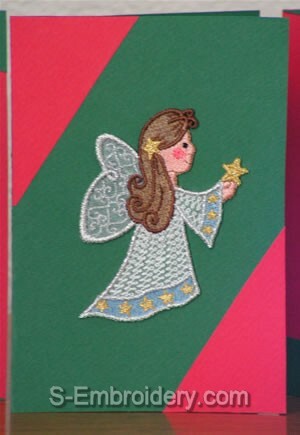 The size of the Christmas angel designs is between 3.72 x 3.67 inches (94.4 x 93.3 mm) and 2.88 x 3.22 inches (73.2 x 81.8 mm). The number of stitches is between 8,077 and 9,611. The thread colors used are 10 or 12. 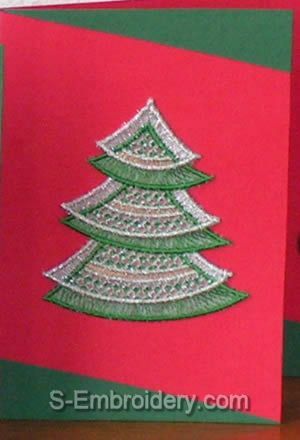 The 3 Christmas tree machine embroidery designs come in the same variations as the Christmas Angel design - #1 to #3 are stitched out on organza, #4 to #6 have the hoop for hanging on the Christmas tree and #7 to #9 are to be stitched out on fabric. The size of the Christmas tree designs varies from3.05 x 3.54 inches (77.5 x 89.8 mm) to 3.20 x 3.75 inches (81.2 x 95.2 mm). The number of stitches is between 9,119 to 11,462 and number of colors is 3 or 5. 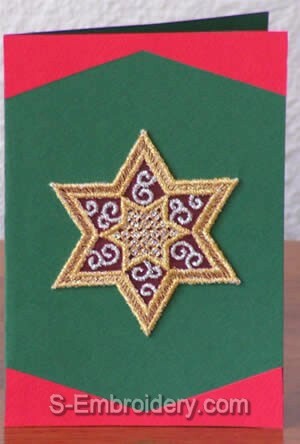 There are 4 different Christmas star embroidery designs and they are available in 3 versions for a total of 11 machine embroidery files. 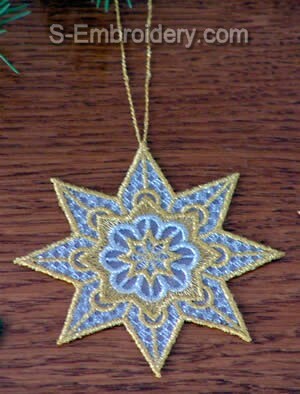 Christmas Star Ornaments # 1 to #4 (4 files) will make fine Christmas greeting card decorations. They are stitched out on organza. Christmas Star Ornaments #5, 6 and 7 (3 files) are also stitched out on organza and come with hoops for hanging the ornaments on the Christmas tree. 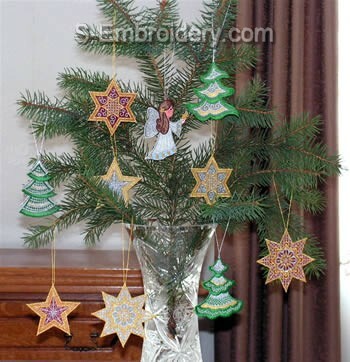 Christmas Star Ornaments #8 to #11 (4 files) are meant to be stitched out on fabric and will make fine decorations for your Christmas machine embroidery projects. The number of stitches is between 2,758 and 11,179. Number of colors is 2 or 4.